"As a manager, my purpose is to serve the greater good by bringing people and resources together to create value that no single individual can create alone..."
So begins the MBA Oath, conceived in early 2009 by Max Anderson, Peter Escher, and a team of Harvard Business School students. They saw that in the wake of the financial crisis, the Madoff scandal, and other headlines, MBAs were being vilified. People were angry because business leaders, many of whom were MBAs, seemed not to care about anything beyond their own private interests. Many began to question the worth of business schools and the MBA degree. The oath quickly spread beyond Harvard, becoming a worldwide movement for a new generation of leaders who care about society as well as the bottom line. Thousands of graduating MBAs have now pledged to conduct themselves with honesty and integrity, just as medical students swear by the Hippocratic oath before they can practice. This book is the manifesto for the movement. It provides not only a strong case for why the MBA Oath is necessary but also examples of how it can be applied in the real world. It will help guide businesspeople through some of the toughest decisions they'll make in their careers. 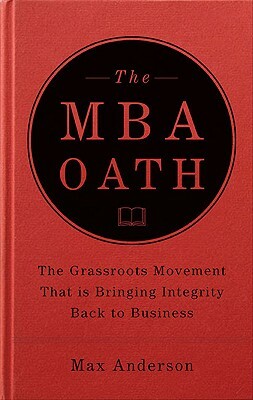 "The MBA Oath...turns out to be a thoughtful response to the [recent] situation in which thousands of MBA students found themselves.... A generation of students went to business school to learn about business and found themselves portrayed as villains because of the misdeeds of their predecessors.... The authors draw on cases taught to Harvard MBA students to expand their view of business ethics from the narrowly legal to a wider vision of responsibility. They write meditatively about everything from ambition to leadership." "Lawyers have their oath of attorney, and doctors have that Hippocratic one, but it struck Max Anderson. . . . that MBAs have nothing. And so he and several of his classmates created the MBA oath, a promise to 'act with utmost integrity and pursue my work in an ethical manner.' . . . These Harvard students have started an important discussion about doing the right thing in business, which is never a bad conversation to have." "In the post-Enron and post-Madoff era, the issue of ethics and corporate social responsibility has taken on greater urgency among students about to graduate. While this might easily be dismissed as a passing fancy-or simply a defensive reaction to the current business environment-business school professors say that is not the case. . . . Those graduating today, they say, are far more concerned about how corporations affect the community, the lives of its workers, and the environment."